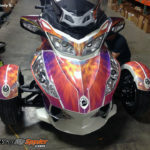 Take a look at this fully custom Can-am Spyder wrap that we created for our customer Cindy B. Cindy contacted us and had made a special design request for us to create a design that had Purple, Pink and Orange tones in it. We had a few discussions on the phone and shared some files along with various image layouts that were potential images for her project. 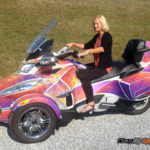 Once Cindy picked the basic Can-an spyder wrap design she liked we were able to incorporate these within our precision cut Can-am Spyder RT body templates. 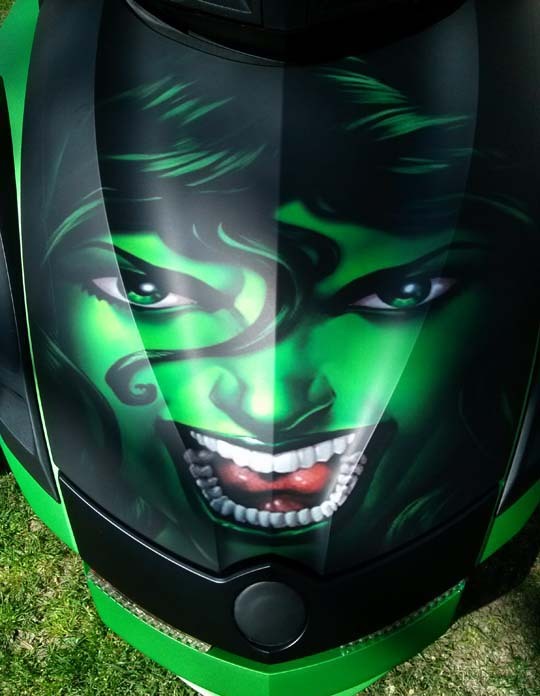 This allowed us to show Cindy exactly with the kit would look like before we actually digitally printed it as a pre-cut easy apply vinyl Spyder RT wrap kit. Cindy looked at our first proof but asked that we make some changes to it by editing some colors for her. Once again we made the edits and resent her another proof. She absolutely loved the second version so we were ready for production. 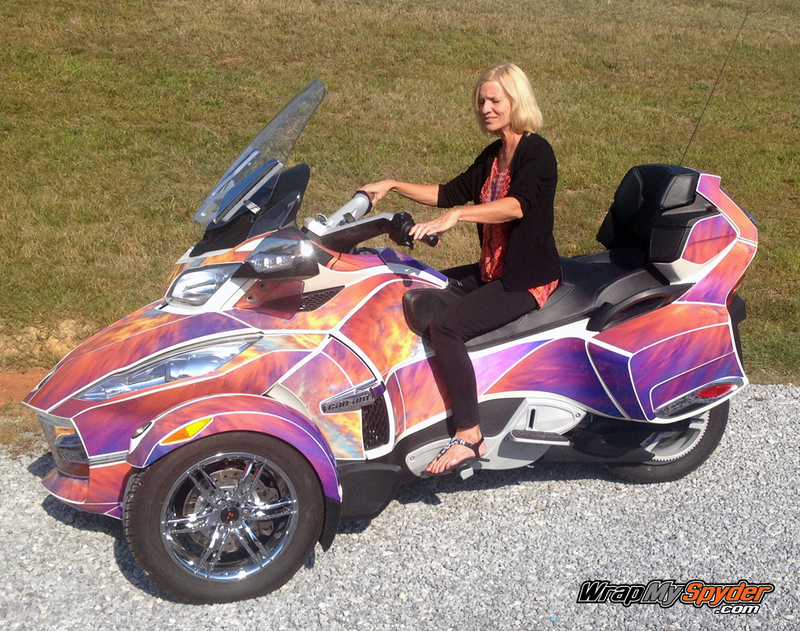 Because Cindy’s BRP Spyder RT Limited was Pearl White metallic she wanted the metallic finish to show through the wrap so we use our high performance cast transparent wrapping film with a glossy cast sheet laminate to produce this Can am Spyder wrap. 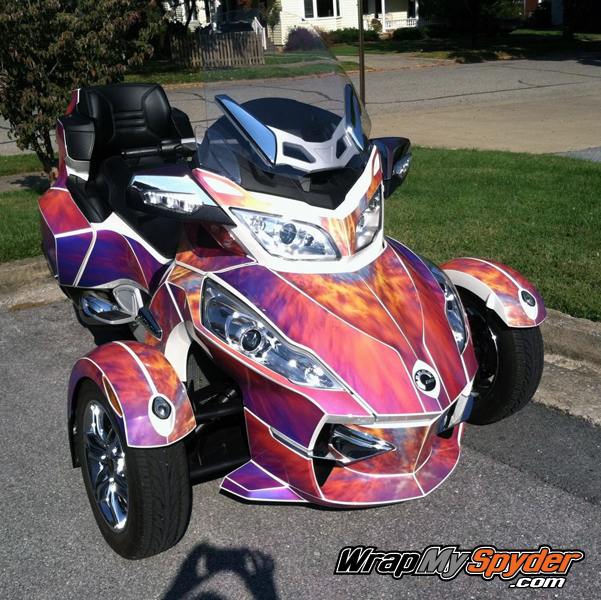 Do you like this custom Can-am Spyder wrap for the RT Limited model? We now offer this kit called C-Buck on our website here. 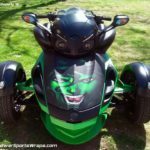 Cindy’s comments below: I want to let everyone who has ever considered getting a vinyl wrap for their Spyder know that they need to contact you as soon as they can. 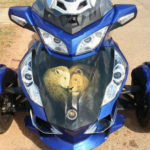 I cannot thank you enough for all your help–from my color choice to my resources for finding a design to websites that provide information and generally fingertip help from start to finish. You always welcomed all my calls and didn’t make me feel like a crazy woman who didn’t know spit from spinola. Your help was appreciated, but your finished product was amazing!!! 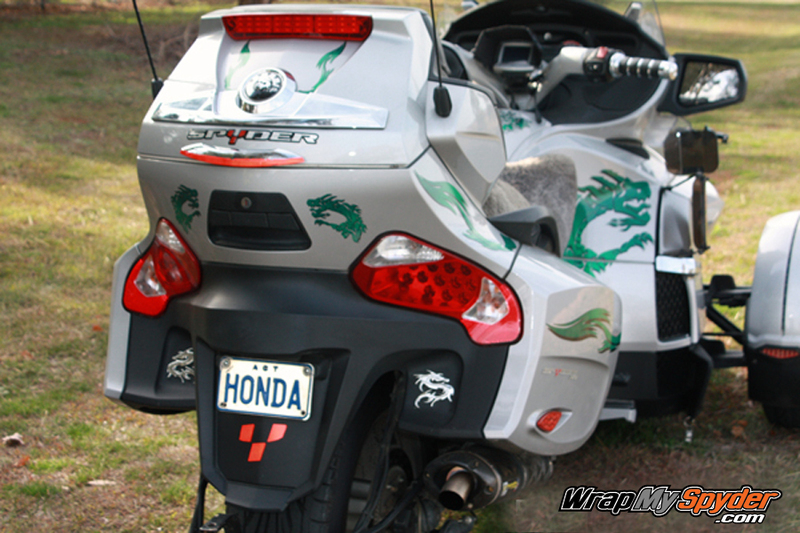 The wrap turned out better than I had hoped. It is exactly what I wanted. It’s absolutely show-stopping gorgeous. The man who put it on for me said he spent hours on the phone with you making sure he was doing it all the right way. You have been patient, kind, and professional. 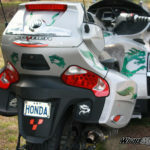 I hope to see many more Spyders wrapped in the future–all with your signature! 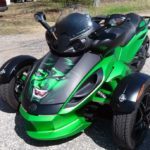 Our C-buck kit is created to cover almost all of the body of the Spyder RT. Pre-cut panels and easy apply wrapping film make installation easier. 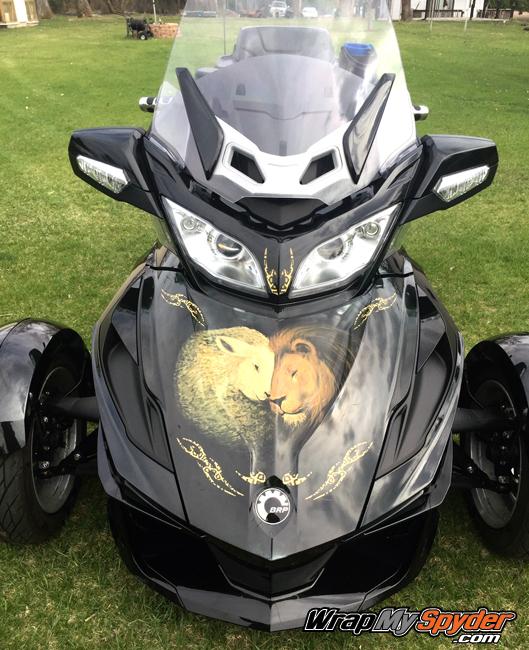 This design Is Called our Lamb Lion Can-Am Spyder Frunk Vinyl Wrap. 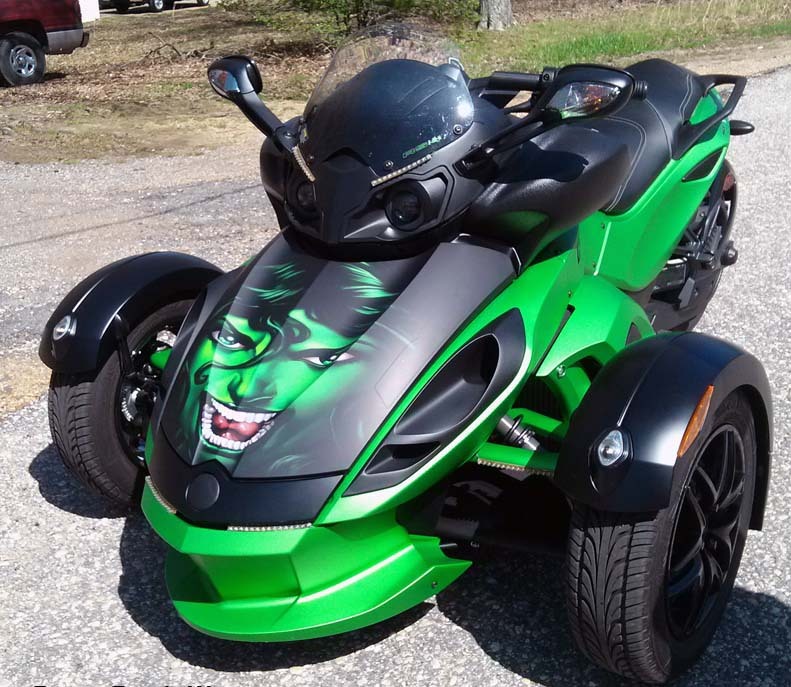 It was created for one of our Spyder RT owners who was looking to personalize her machine and make it stand out from all the others. 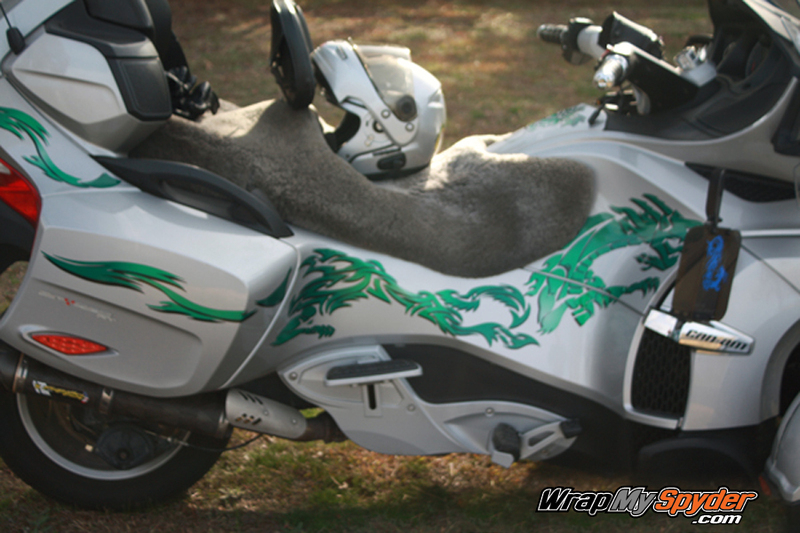 Our customer Christy applied this wrap herself using our easy peel and stick wrapping film. 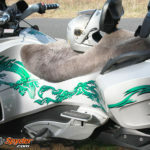 We can create a custom look just for you please contact us to discuss the details. 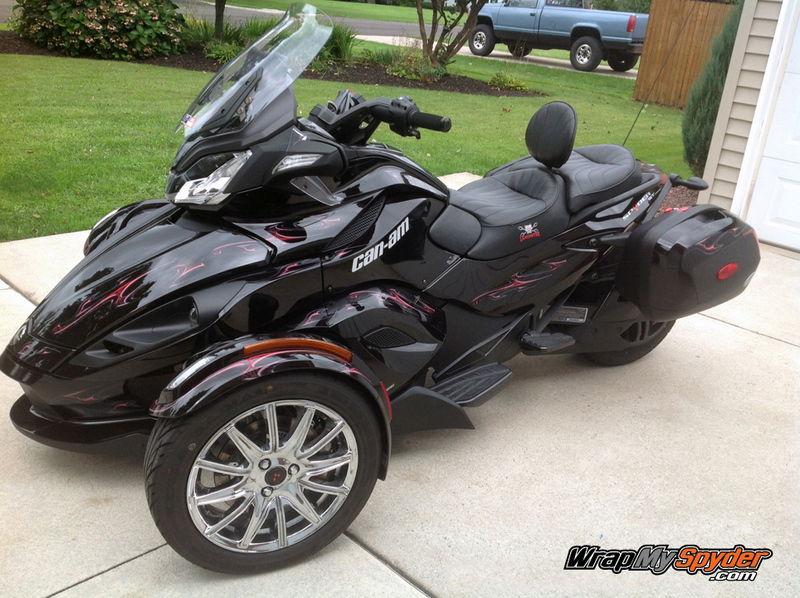 We get many requests each day with design idea that Can-am Spyder owners have for their machines. We do our best to help with as many projects as we can but some we do have to turn down for various reasons. 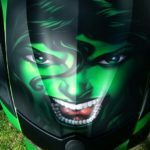 This design She Hulk Vinyl Frunk Wrap, is a great example of how we can make your idea a reality. 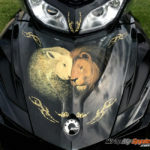 With a bit of some communication and some idea sharing we can make your concept idea a reality. Contact us to see how we can help. 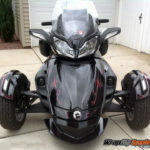 A Wrapmyspyder.com customer all the way from Australia sent over these awesome photos of his Can-am Spyder RT. 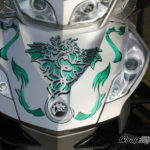 The pictured Dragon Green graphics were custom created just for him. 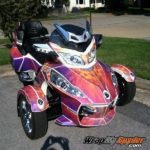 This is yet another perfect example of how Wrapmyspyder can custom create the right look just for your Spyder. 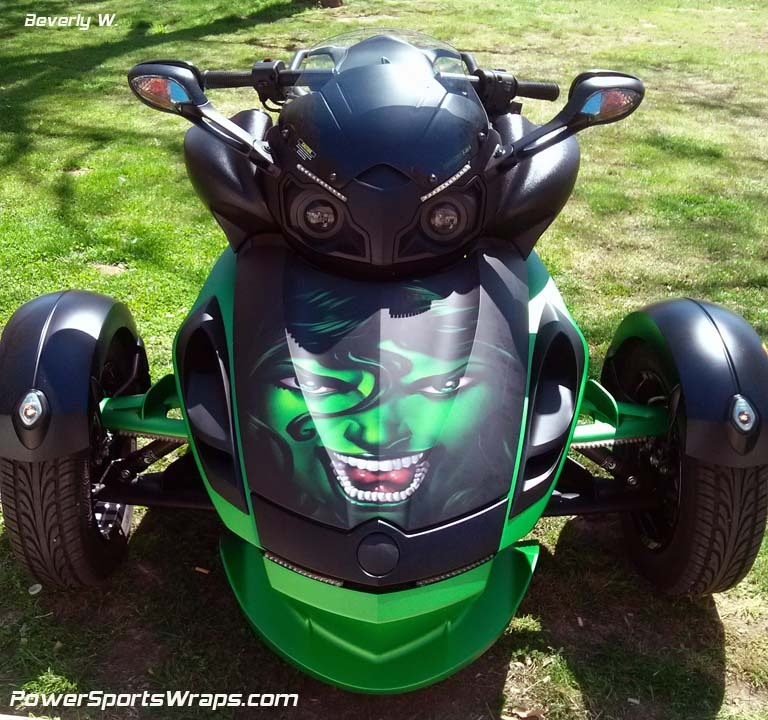 We work closely with our customers no matter their location to give them the look and feel they want to personalize their Can-am Spyder. How can we help you? 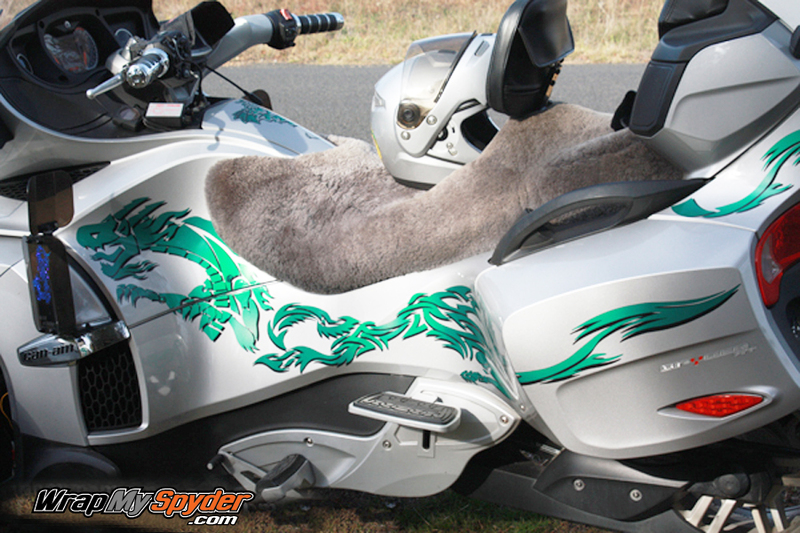 Do you own a Spyder? 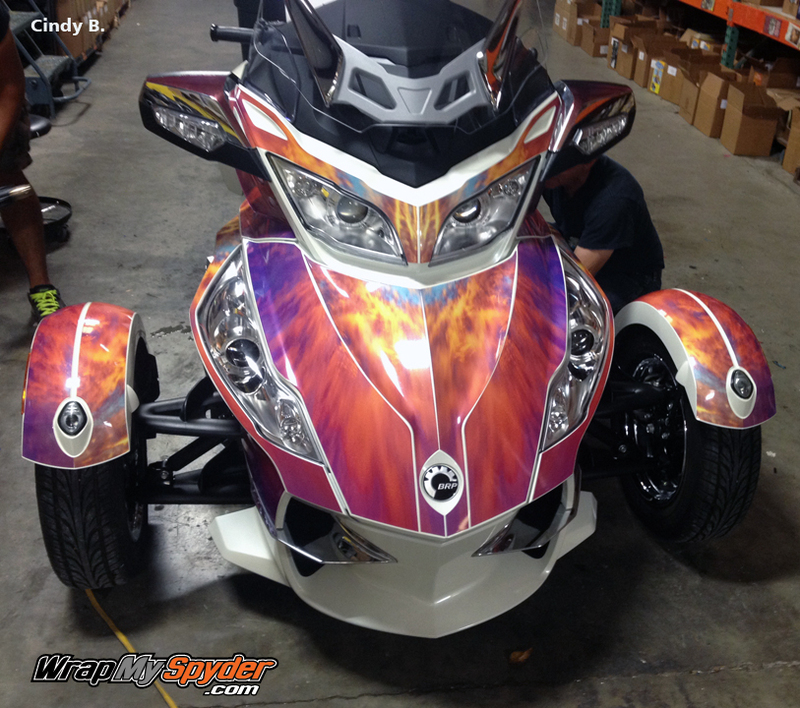 Did you know WrapMySpyder is only one of a few who offer more than 55 pre-cut body templates for these machines? This means awesome things for you! 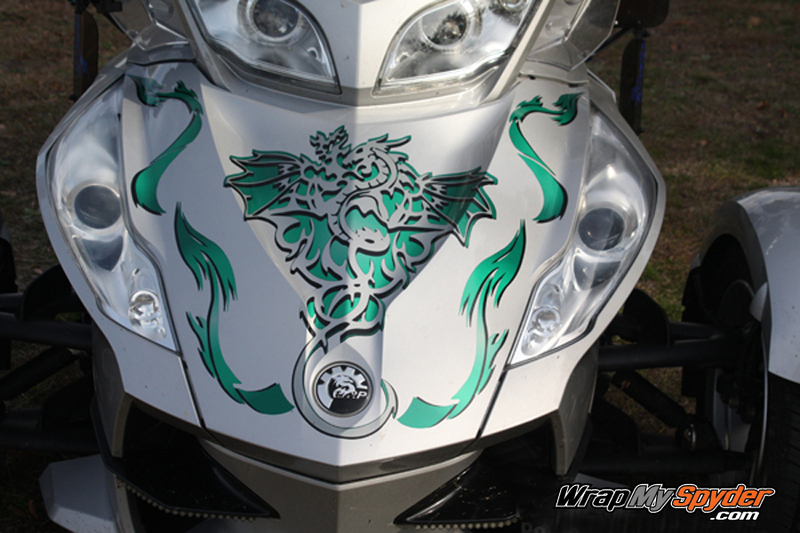 We can offer you a pre-cut kit with a pattern fill in each pre-cut piece to create a custom look like no one else has. 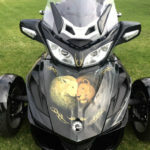 Offering over 200 fill patterns, you can choose from a wide variety for your custom Can-am Spyder decal kit. 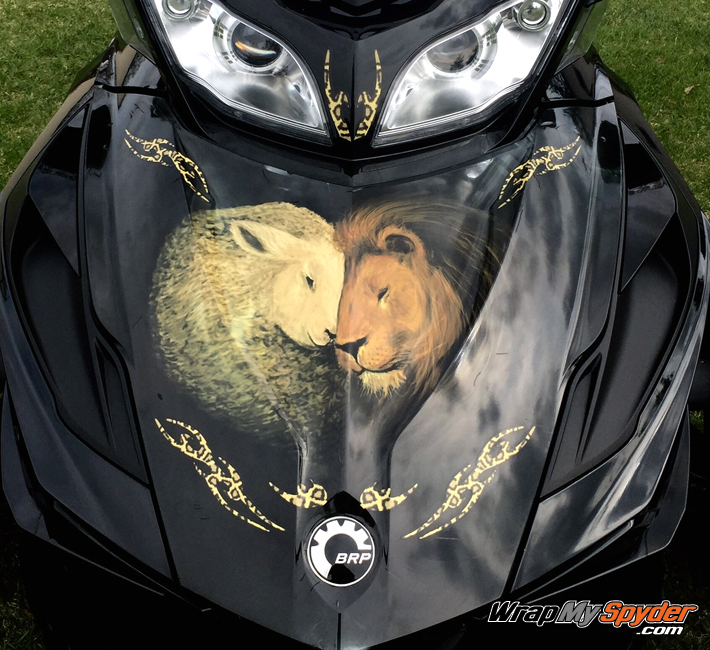 The Can-am Spyder RT (below) showcases yet another option you have for Spyder decals. 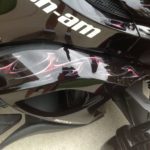 This kit is our Ghost Red Lightning kit option is called a Shape-cut decal kit where you have no base film- only the design. 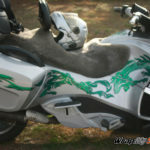 This kit is available in many color options. This style kit is much easier to apply. As you can see, first time user, Ed, did a great job! 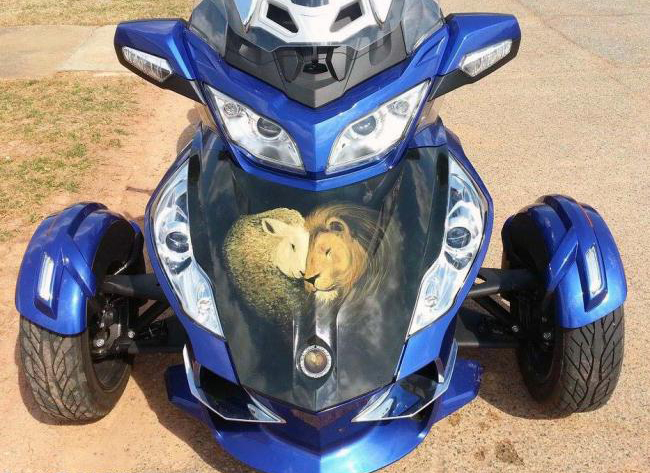 If you have an idea for your Spyder please contact us and we will do our best to assist you. 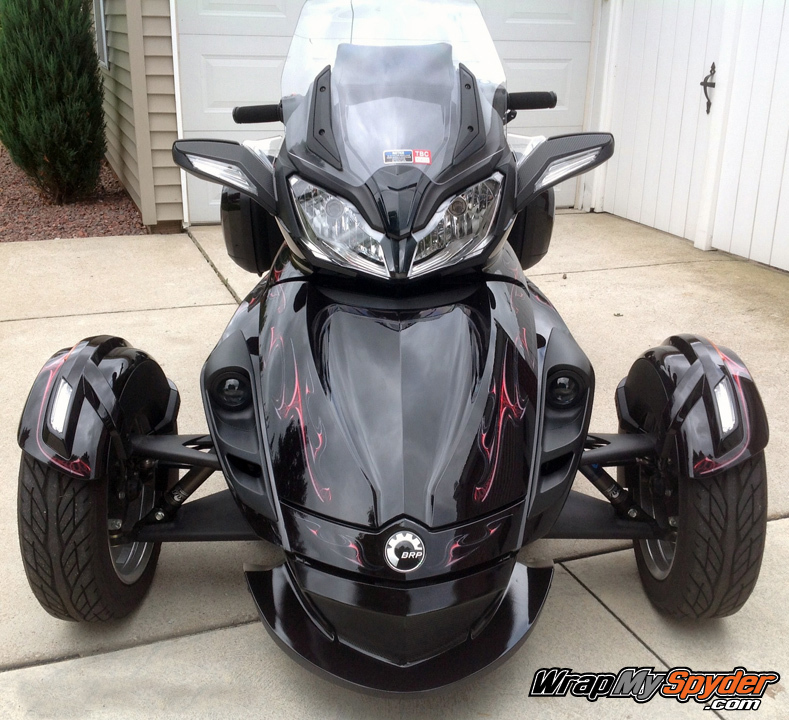 See our latest Can am spyder project gallery here. 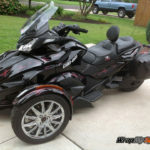 If you would like to see what we have available for Spyders on our website take a look here. With it’s many pieces you can create the subtle look that fits your personality. You apply the pieces as you like. 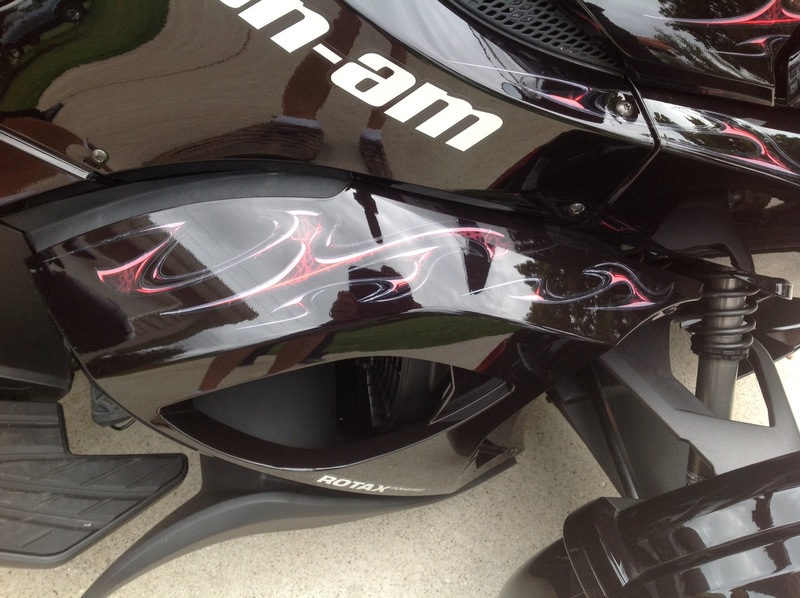 Accent and add flare to any panel on your Spyder by installing our Ghost Red Lightning kit.